Did you know that Rakuten, Japan's largest online shopping mall is finally in Singapore? I have always been a fan of Japanese products and I'm absolutely stoked that these products are now easily available here! 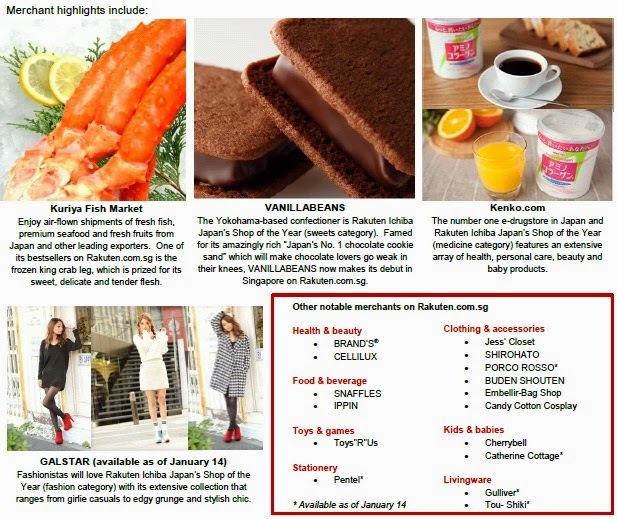 Rakuten Singapore currently features more than 120 Japanese and local merchants with over 40,000 products across more than 10 categories ranging from fashion, food, health and beauty products, electronics, kids' and babies' products, toys and games, livingware, furniture and decoration, books, pet products, and even vehicle accessories. In celebration of its launch, Rakuten Singapore is now offering free delivery for all products (min purchase of S$30) from January 14, 2 p.m. to January 17, 11.59 p.m. Besides free delivery, Rakuten Singapore is also offering a special discount code to all readers of Shopping Queen's Haven! Key in "REGINA20" upon check out to enjoy S$20 discount off a minimum spend of S$100! This discount code is valid for members only, so please remember to sign up as a member on Rakuten Singapore's website and sign in when you check out! From now till 31st March, members can also accumulate 10 times more Rakuten Super Points by paying for your purchases using Mastercard.